The Purana-Qila (Purana-Qal's) occupies the ancient mound, which conceals perhaps the ruins of the city of Indraprastha of Mahabharata story. Sher Shah Suri demolished the city of Dinpanah built by Humayun and on the same site raised this citadel. It is irregularly oblong on plan, with bastions on the corners and in the western wall. Its ramparts cover a perimeter of nearly 2-km.and has three main gates on the north, south and west, the last one functioning as the entrance now. The gates are double-storeyed, built with red sandstone and surmounted by chhatris. On the inside, against the enclosure wall run cells in two-bay depth. 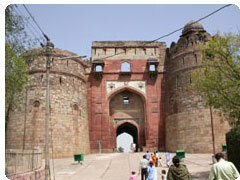 Among the three main gates, the northern one is called the 'Talaqi-Darwaza' or the forbidden gate. Why and when the entrance through it was forbidden is not known. Above the oriel windows on its front are carved marble leogryphs engaged in combat with a man. The exterior of the gate was originally decorated with coloured tiles, and the rooms with incised plasterwork. It is believed that Sher Shah left the Purana-Qila unfinished, and Humayun completed it. Among the scribblings in ink that existed in a recess of the gate, there was a mention of Humayun, and it is possible, therefore, that if the gate was not constructed by Humayun, it was at least repaired by him. In the southern gate, which is called the Humayun-Darwaza, there existed a similar inscription in ink mentioning Sher Shah and the date 950 A.H. (1543-44). Purana-Qila originally lay on the bank of the Yamuna. The general depression on the northern and western sides of the fortress suggests that a wide moat connected with the river existed on these sides, which were approached through a causeway connecting the fortress with the main land. In 1955, in some trial trenches sunk in the south-eastern portion of the Purana-Qila, pieces of the Painted Grey Ware turned up, apart from relics and remains of later period. Since this characteristic ware had been noticed earlier at several sites associated with the story of the Mahabharata and had been dated to around 1,000 BC, it's occurrence here seems to support the tradition of Purana-Qila being the site of Indraprastha, capital of the Pandavas, heroes of the epic Mahabharata. Excavations were resumed here in 1969 along the flanks of the passage leading to the Water Gate in the eastern wall and continued till 1973. A settlement of the Painted Grey Ware people has not been located, but a continuous stratification from the Mauryan to early Mughal period has certainly emerged. Pieces of the Painted Grey Ware occur, however, sporadically but among later deposits. Evidence of the Mauryan Period (c.300 BC) is provided by the existence of the Northern Black Polished Ware, a fine hard earthen pottery with a glossy surface, punch-marked coins, human and animal terracotta figurines and inscribed terracotta seals. Soak-wells lined with terracotta rings and burnt bricks have also been found, although most of the dwellings were made of mud bricks or wattle and daub, sometimes reinforced with wooden posts. The Northern Black Polished Ware continued during the Sunga Period (c.200 - 100 BC) along with plain red pottery. The houses were largely built of local rubble or of mud bricks over rubble foundations. Tamped earth or mud bricks made up the floors. 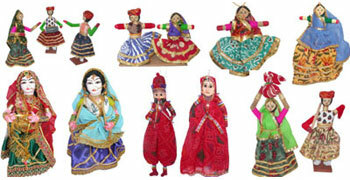 The characteristic art of this period, reflecting the religious beliefs of people, is represented by small terracotta plaques modelling semi-divine beings ('yaksas and yaksis'). Uninscribed cast coins of the Mathura kings and terracotta sealings also occur in these levels. Stamped decoration marks the red earthenware of the next Saka-Kushan Period (c.100 BC - AD 300). Firm evidence of the chronology of this period is provided by the copper currency of the Yaudheyas and Kushans. The increasing use of burnt brick appears now to lend an urban look to the settlement. Surprisingly, in the levels of the succeeding Gupta Period (c.400-600) the houses that have been encountered are built of brickbats. A gold-plated coin with the figure of an archer on the obverse and the legend Sri-Vikrama on the reverse leaves no doubt that it belongs to one of the Gupta rulers. Inscribed sealings and beautifully modelled human figurines are other characteristic objects of this period. A coarse red earthenware, terracotta figurines and pieces of fine but damaged stone sculpture indicate the occupation of the site during the Post-Gupta Period (c.700-800). Towards the end of the Rajput Period (c.900-1200) a massive rubble wall was raised to enclose perhaps part of the town, although the houses continued to be built with rubble, brickbats and mud bricks. There was little change in pottery. Coins of ' bull and horseman ' type, including those of Samanta Deva, have also been recovered from these levels. During the succeeding Sultanate rule (1206-1526), rubble and brickbats were used for ordinary houses. But it witnessed the introduction of glazed ware, both of Central Asian affinities and local manufacture. Coins of Balban (1266-1286) and Muhammad Bin Tughluq (1325-1351) have turned up in these levels. Typical and fascinating objects of the early Mughal Period (1526-1556), representing the rule of Babur, Surs and Humayun, came from a refuse dump of discarded broken household objects. These included jars of eggshell-thin grey ware, glazed ware dishes and painted Chinese porcelain, a piece of which bears the Chinese inscription made in the great Ming Dynasty of the Cheng Hua era' (1465-87). On another piece is inscribed a fairy tale in Chinese verse. Other interesting objects comprised glass wine bottles, a gold earring inlaid with emerald and pearls and a coin of 'Adil Shah Sur (1552-53). Among the few buildings still extant within the Purana-Qila is the 'Qal'a-i-Kuhna-Masjid' (mosque of the Old Fort), built by Sher Shah in 1541. Its prayer-hall measures 51.20m by 14.90m, and is fronted by five openings with horseshoe-shaped arches. The central arch, higher than the others and framed within a projection is flanked by narrow fluted pilasters. The recessed surface of the arch, through which there is an opening, is beautifully decorated with inlay of marble and other stones and contains a small oriel window at its apex. The two arches on either side are similarly treated but with less of ornamentation. In the arches at the ends plain grey stone is used instead of the red stone. The minhrabs inside the hall are richly decorated with concentric arches, which enhance the scope for ornamentation. The rear-corners rise with double-storeyed towers and oriel windows. From both the ends in the hall staircases lead to a narrow passage on the second storey running right round the rectangular hall. The central bay of the hall is surmounted by a beautiful dome, with traces of chhatris on either side. In the courtyard originally existed a shallow tank provided with a fountain. This mosque occupies an important position in the development of the mosque, exemplifying the transition from the Lodi to Mughal styles. The fa�ade of five arches, oriel windows and corner-towers at the rear are features, which have developed from the earlier mosques such as the Bara-Gumbad-Masjid, Moth-ki-Masjid and Jamali-Kamali-Masjid. 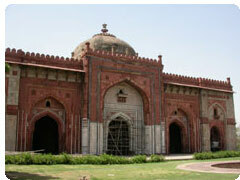 To the south of the Qal'a-i-Kuhna-Masjid is a double-storeyed octagonal tower of red sandstone relived by marble. It is surmounted by an octagonal pavilion or chhatri. On each of its sides is a recessed arch in the centre. On the second storey the central chamber is cruciform, with recesses on its four sides. The dados of its interior are decorated with glazed tiles, while the upper portion contains incised and painted plasterwork. The purpose of the building is not very certain. It may have been built by Sher Shah as a pleasure resort, but is believed to have been used as a library by Humayun, from the steps of which he fell down and ultimately met his end. This is the story of the city of cities�.. DELHI; of the site where a great empire rose and fell before the dawn of history; where citadels of emperors appeared and disappeared; a city of mysterious eternity whose old ruins proclaim a majestic and imperial past and whose present pulsates vibrantly with the even flowing life force of India. The eternal Yamuna bears witness to the glorious and tumultuous 5,000-year-old history of Delhi. A history, which begins with the creation of Indraprastha by the Pandavas and the transformation of this barren gift of the Kauravas into an idyllic haven. A history which encompasses the various kings and emperors who fixed their royal citadels here - Indraprastha, Lal Kot, Qila Rai Pithora, Siri, Jahanpanah, Tughlakabad, Ferozabad, Dinapanah, Delhi Sher Shahi or then Shahjahanabad. But, combined and integrated into one, these 'new cities' have always been called Delhi and howsoever many names it may have acquired, Delhi has always been intrinsically identified with power and imperial sway. The historic Purana Qila, which has stood witness to Delhi's rejuvenation, periods of anarchy, and the rise and fall of empires, is the venue for the spectacular sound and light show which brings alive the history of the capital. Amidst the tranquility of the splendidly panoramic environs of Purana Qila, select episodes from the annals of Delhi's historic and legendary past are brought to life. The viewer is transported centuries back in time to witness Draupadi being reduced to a Dasi (maid servant) of Hastinapur, the gallant Prithviraj Chauhan galloping away with the beauteous Samyogita, Sher Shah Suri being blown to bits by a misfired cannon, the clash of a sword weilded by the legendary Razia Sultan, Humayun tragically tumbling down the steps of his library and Bahadur Shah Zafar surrendering to the British. These and many more such episodes out of Delhi's 5,000-year-old saga can be relived during this evocative 62 minutes Son et Lumiere. Advanced technology has made it possible to add special effects which combine with the unique ambience to make this show a hauntingly unforgettable experience. Boating: Rs. 20/- per person for every 15 minutes is charged for boating in lake adjoin to fort.